Museum Archivist Francesca Hillier explains how the collection got too big for one institution, and why you won’t find dinosaurs in Bloomsbury. Natural history objects were part of the British Museum from the start, having formed a significant part of Sir Hans Sloane’s founding collection. They continued to be displayed here for over 120 years, until 1881, when they began to leave for the new British Museum (Natural History) in South Kensington – known today as the world-famous Natural History Museum. Three giraffes and a rhinoceros on the staircase of the ‘old’ Museum, Montagu House. Watercolour drawing by George Scharf, 1845. Hans Sloane was a physician, so had a huge interest in natural history. When he died in 1753, his collection was bequeathed to the nation, and the British Museum opened in 1759. By 1807 the Department of Natural and Artificial Productions had become large and unwieldly, so the Museum’s Trustees decided to separate natural history from antiquities. Two new departments were formed – Natural History and Modern Curiosities and Antiquities. This decision coincided with the appointment of German botanist and mineralogist Charles König as Assistant Keeper of the natural history collections. He was to have a significant impact on these collections until his death in 1851. A giraffe in the Central Saloon (now Rooms 38–39), with various other mammals in the cases behind. Photograph by Frederick York, 1875. The natural history departments continued to grow and in July 1834 the Trustees asked the departmental officers to ‘make full and detailed reports upon the state of the several branches of their departments’. These reports showed, for example, that the minerals collection was considerable and comprised probably ‘the most extensive anywhere exhibited to public view’. The zoology report stated that out of the 942 species of mammals then known, 330 were represented in the Museum. 4,109 species of bird were known and 1,831 were in the Museum. 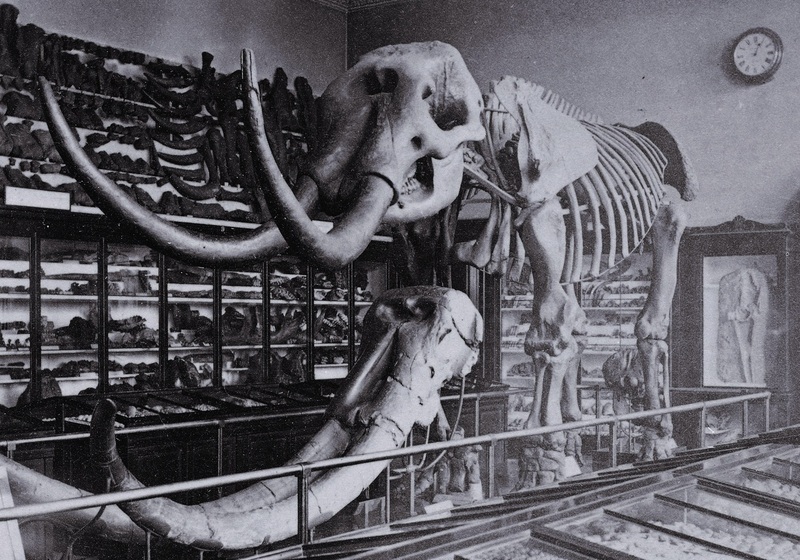 As well as exotic animals such as giraffes and rhinoceroses, the specimens also included extinct animals such as mastodons, megatherium and giant deer. Later in the 1830s the natural history material was further subdivided into the Botanical Branch, the Mineral & Geological Branch and the Zoological Branch. Birds in the Eastern Zoological Gallery. Photograph by Frederick York, 1875. The care and preservation of these collections then became a concern. A sub-committee for natural history was set up in 1838 and König reported that there was an extreme lack of space, both for display and storage of the current collections – never mind for any future additions. New galleries had been planned in the new museum building being constructed at Bloomsbury. The natural history collections had begun to be relocated there in the 1820s but lack of space remained an issue, as well as the storage and cataloguing of material. The North Geographical Gallery, showing the level of overcrowding (and a couple of giant deer). Photograph by Frederick York, 1875. In 1846 a solution was suggested by Lord Egerton, later the Chairman of the Royal Commission on the Museum. He wrote to the Prime Minister, Robert Peel, proposing that fossils and similar objects should be transferred to the Royal College of Surgeons. There, he reasoned, they could be better cared for under the curation of Richard Owen (who would later be employed by the Museum – but possibly most famous today for coining the term ‘dinosaur’). The megatherium skeleton (far left) in the North Geographical Gallery (6th Room). The megatherium was an elephant-sized ground sloth that lived in South America until it became extinct about 10,000 years ago. The right of the picture shows the skeleton of a mastodon (an early relative of the elephant that lived in North and Central America and became extinct around 10,000 years ago). Photograph by Frederick York, 1875. In 1856, with space still a problem, Anthony Panizzi, the newly appointed Principal Librarian (i.e. the Director), and Richard Owen, the new Superintendent of the Natural History Departments, began discussions about relocating the natural history collections. They were determined to found a new museum, and favoured South Kensington as a location (just south of where the Great Exhibition took place in Hyde Park in 1851), although other sites considered included Crystal Palace (where the Great Exhibition structure had been moved to Sydenham in South London), Embankment and near Victoria Station. The option of extending the site at Bloomsbury was considered too expensive. Wrangling about the location of this new museum continued, but by 1870 the decision was made. By the end of the decade the natural history collections were being prepared for their move. A shark and attendant! The attendant was presumably included to show the scale of the fish. Photograph by Frederick York, 1875. The mineralogical collection was first to be transferred, in 1880, followed by the geology and botanic collections. The new museum was opened, without ceremony, to the public on 18 April 1881. The zoological specimens remained at Bloomsbury until 1883 – it took 394 trips by horse and cart over 97 days to move it! Although commonly referred to as the Natural History Museum, it was officially known as the British Museum (Natural History) as late as 1992, despite legal separation from the British Museum in 1963. Happy Birthday to our fellow institution! Find out more about natural history in South Kensington. Find out more about the Museum’s original collection in the Enlightenment Gallery.